Lavery Transport is a family-run business which has many years experience in all types of haulage and transport services. They understand the unique requirements in today's haulage industry and ensure their services are what continues to define their success. Nicola Lavery gave Irish Trucker & Light Commercials the lowdown on their success to date. For over 30 years, Lavery Transport Ltd has been a leading provider of road haulage and distribution services throughout Ireland the U.K and are specialists when it comes to providing their customers with a cost effective and reliable range of transport solutions. Lavery Transport is a family run business which was started back in 1984 by the late Charlie Lavery from their Seagoe depot which is located convenient to the motorway, 30 minutes from Belfast and less than two hours from Dublin. The company has grown from strength to strength starting with just one rigid providing cross border distribution to it current fleet of 27 units which provides an overnight service to most regions in the UK and Ireland. With approximately 35 employees on its payroll, the company and staff (all of their drivers are CPC covered) pride itself on its reliable service and the importance of providing a good customer service making them leaders within the road haulage industry. They also pride themselves on the loyalty to their customers and always welcome new customers and their challenges. The wide range of services they provide includes Groupage throughout the UK/Ireland; Next day deliveries available in Ireland; 2 day for UK/Scotland; Next day deliveries to Scotland on request and Tail lift collection/deliveries when required throughout Ireland. In addition, Lavery Transport are fully licensed to cover waste in Ireland and UK and fully covered under RHA 1998 goods in transit insurance and liability. Their Portadown premises features a purpose built office, a garage with capacity for two units and 45 ft trailer; a large secure concrete yard with parking capacity for full fleet and a 5,000 sq ft of warehouse storage. With the diverse nature of the businesses of their long standing customers, it's imperative that Lavery Transport supply and utilise specialised vehicles and services suited to their customers needs. 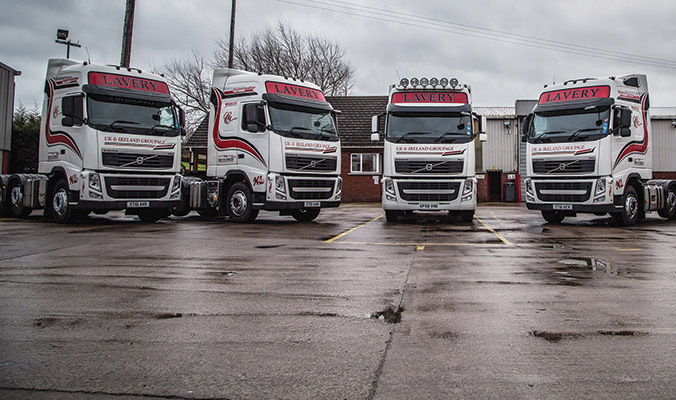 Volvo is the make of choice as regards Lavery Transport's modern and well-maintained fleet and they have 50 x 26plt curtain side trailers (several equipped with sliding roofs); 3 x 17T curtain side rigids; 10 x 6*2 44T Tractor units and 14 x 4*2 38T tractor units at their disposal. The progressive company has invested heavily in their computerised traffic system and all Lavery Transport's vehicles are fitted with trackers which means they can be tracked online, day or night, from anywhere in the world. Today, Nicola Lavery is helping to build on the solid foundations laid by her father Charlie and she runs the family company along with her mother Rosaleen (director), sister Emma and brother Niall. The family appreciate the continued support of their long serving staff. “We're lucky in that we have a loyal customer base and we value their continued support,”she outlined to Irish Trucker & Light Commercial. “Looking to the future, we would hope to increase the size of our fleet if things keep moving in the right direction. Lavery Transport care about their customers and their focus is on providing a first class service for all their clients no matter how big or small. They are constantly aiming to improve their customer satisfaction and are confident in providing expert haulage services to businesses in the UK and Ireland. You can rest assured that their team of highly experienced and professional drivers have your best interests at mind. For them it’s all about attention to detail so give Nicola and the team at Lavery Transport a call at the number below to find out more. Alternatively, you can check out their recently updated website at www.laverytransport.co.uk.